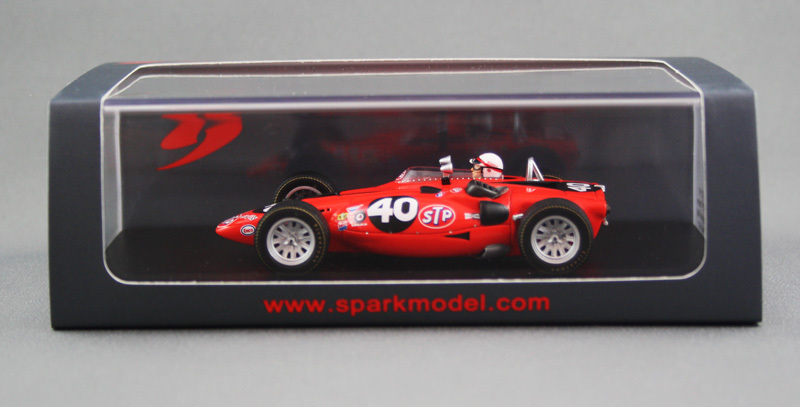 I’m a fan of the ‘Indy 500 winners’ series models coming from Spark – though this isn’t one of them! 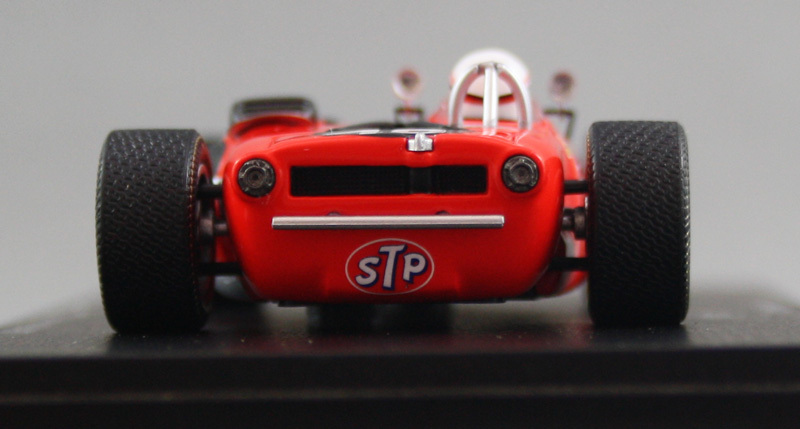 Despite not being a ‘500 winner, I purchased this model because it’s one of the more significant and technically unique race cars that competed at Indianapolis, almost winning the ’67 race. 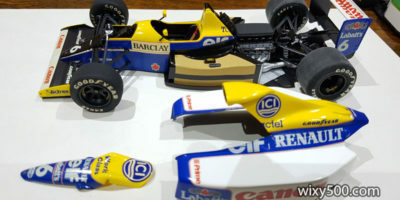 It’s also the only decent ready-built 1:43 version on the market. 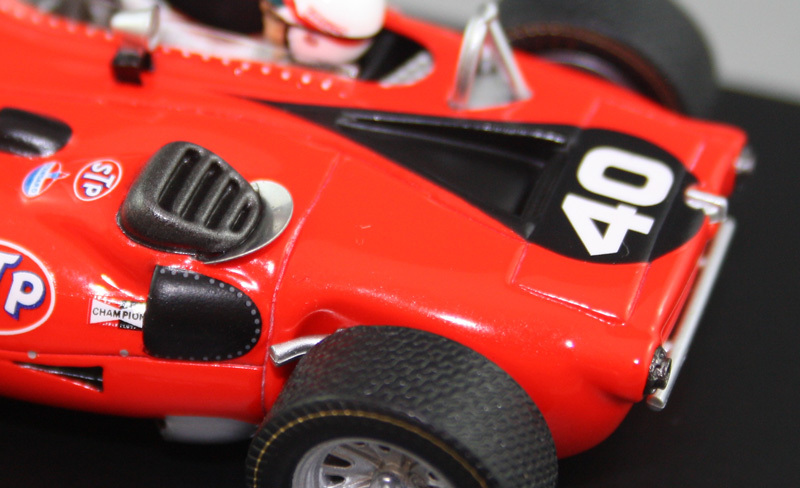 This car has been modeled by various companies in various scales over the years, but only the boutique kit manufacturers have something of passable quality. 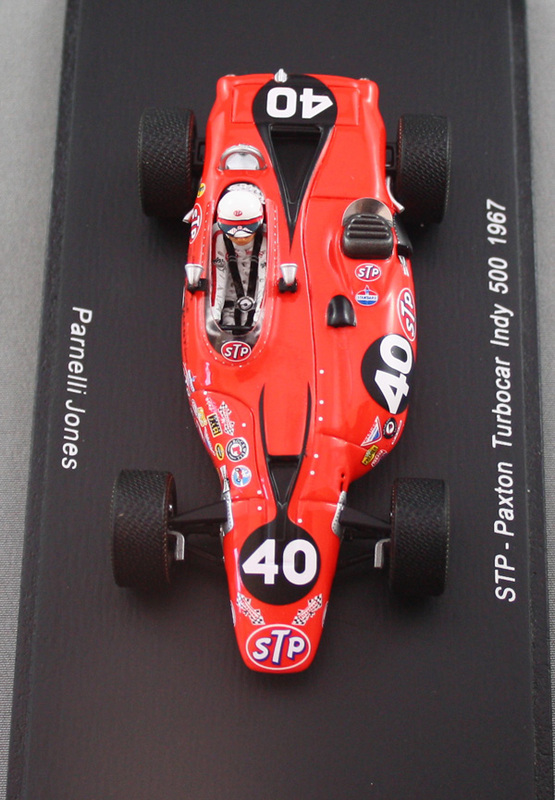 While the name on the plinth is the correct official name of the car, the STP Paxton Turbocar was not actually a turbocharged car – it was powered by a Pratt & Whitney turbine engine. 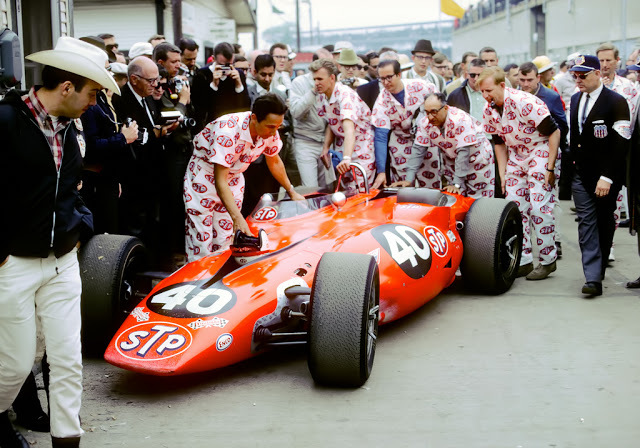 Mr STP, Andy Granatelli, had been trying to win the Indy 500 for a number of years. 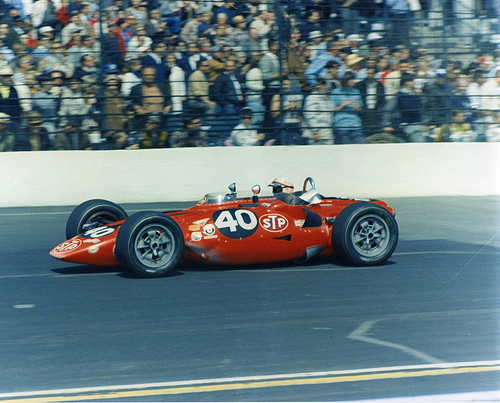 In 1967 he finally ditched his powerful Novi-engined Roadsters and turned up at Indianapolis with a turbine engine fitted to the left side of a new four-wheel drive chassis, and hired former winner Parnelli Jones to steer it. 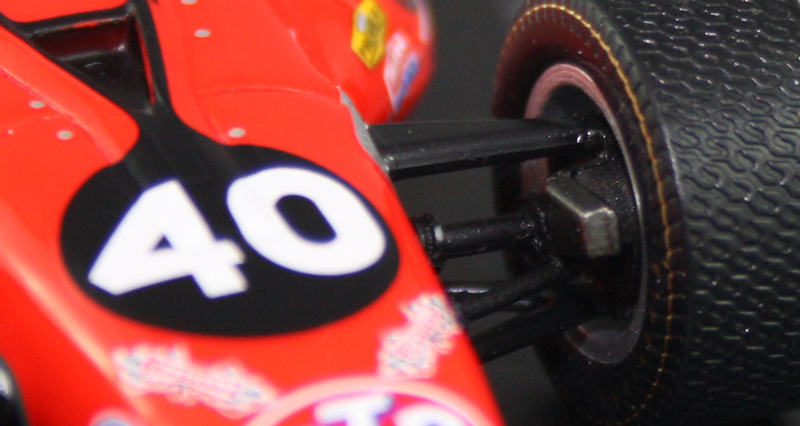 Dubbed “Silent Sam” and “Whooshmobile”, the bright red #40 dominated the race, leading 171 laps. 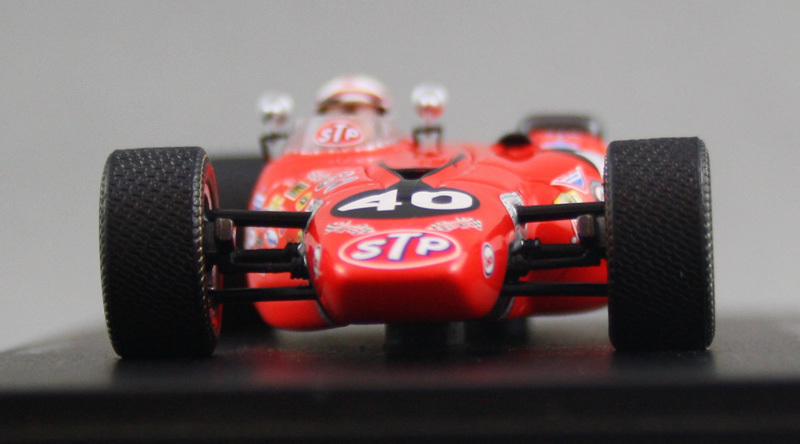 But with three to go, Whooshmobile rolled to a silent stop with transmission bearing failure, allowing AJ Foyt through to claim his third Indy 500 victory (has been modeled by Spark – see review HERE). 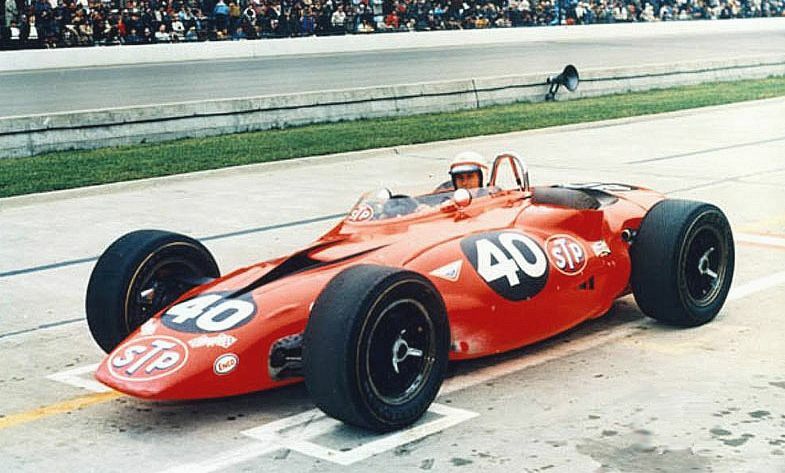 Granatelli returned with his turbines the following year, now installed in the sleek Lotus 56 ‘wedge’ chassis (which has also been modeled by Spark). Despite entering five of the machines (2 were destroyed in practice), Joe Leonard taking pole position, then leading late in the race, none of the STP cars went the distance. Engine rules were subsequently changed, rendering turbine cars uncompetitive. The general shape of Spark’s version looks ok and the finish of the fluro-red paint is very good. 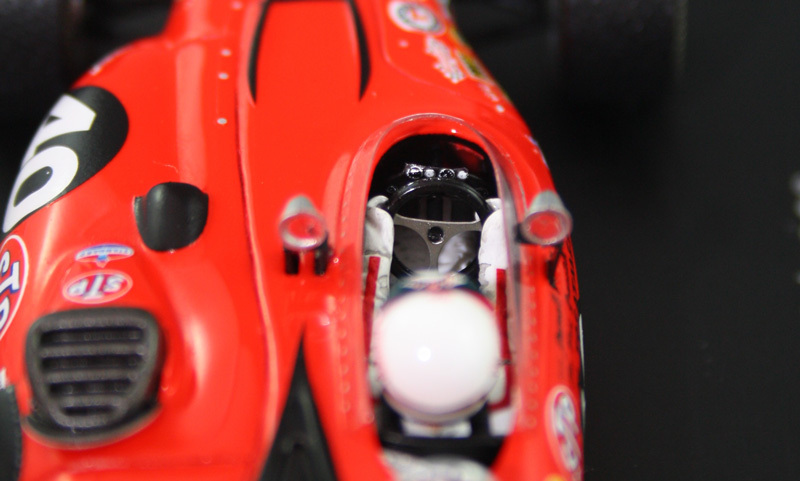 Impressively, the model carries accurate markings for race day and includes a number of race-day ducts that were not fitted for qualifying, plus the correct mirrors. 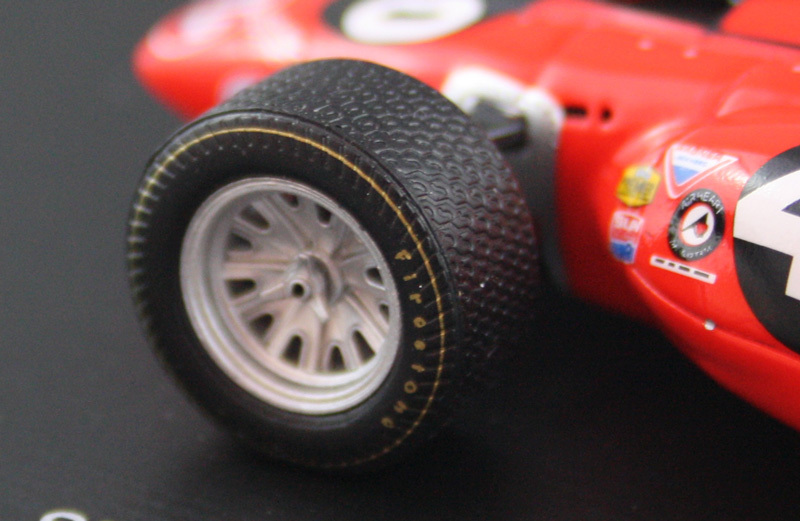 On the down side, the ‘shut lines’ for the bodywork panels are a little heavy, the tyres have tread up the sidewall(! ), the rollover bar is frosted (not chromed) and the rims are a poor representation of what ran on the car. Overall, this a pretty good model from Spark and I reckon it captures the essence of this unique racecar quite well. 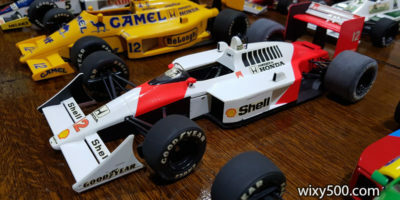 Images of real race cars on this site are being used in the public domain by various sources on the www and social media. If I’ve used an image that you have the copyright to, let me know and I’ll give appropriate credit, or remove it.